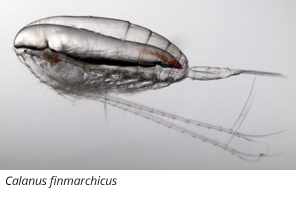 Copepods and pteropods are the two groups of zooplankton most often studied in relation to ocean and coastal acidification (OCA) because they are important food sources for larger species. Copepods appear to be relatively robust to high levels of atmospheric pCO2 up to about 3,500 ppm. For example, Calanus finmarchicus survival in one study was not affected by pCO2 levels less than 7,000 ppm, and survival of Acartia tonsa copepodites and adults was not affected by pCO2 levels less than 3,000 ppm. 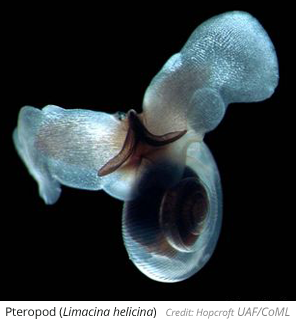 In contrast to copepods, pteropods are highly sensitive to increased pCO2 conditions. In particular, calcification is negatively affected at both the larval and adult life stages. Moreover, shell dissolution has been shown at larval, juvenile, and adult life stages. Smaller pteropod shells or shells with reduced integrity due to dissolution could have ecological implications for the food web. How Does Coastal Acidification Affect Marine Life?